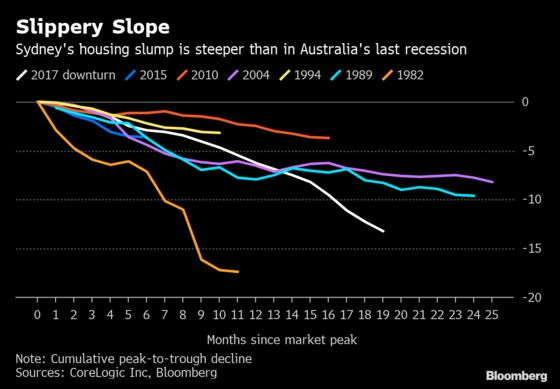 (Bloomberg) -- The apartment market in Australia’s largest city is “quite soft” due to a sharp rise in supply that’s increased risks to financial stability, a senior central bank official said. Sydney added more than 80,000 apartments in the past few years, increasing the city’s housing stock by about 5 percent, Reserve Bank of Australia Assistant Governor Michele Bullock, who oversees the financial system, said in the text of a speech. In Melbourne and Brisbane, which also saw substantial construction, apartment prices have so far held up, she said. The RBA has dropped a tightening bias in favor of a neutral policy stance as signs mount that tumbling property prices -- down 13.2 percent in Sydney -- are prompting consumers to rein in spending and slowing economic growth. The central bank has kept interest rates unchanged for 2-1/2 years at a record-low 1.5 percent and markets now expect a quarter-point cut by year’s end. The Australian dollar fell as much as 0.4 percent after Bullock’s comments. It bought 70.71 U.S. cents at 1:16 p.m. in Sydney. Bullock’s boss, Governor Philip Lowe, has noted that a key problem in the east coast housing market had been the slow response to demand pressures. That resulted in Sydney property prices surging 75 percent in the five years to mid-2017. By the time the swathe of new apartments came online, the demand had fallen away and prices slid. The property market has also been hit by tightening credit as banks scaled back lending to investors and more heavily scrutinized borrowers in the wake of an inquiry that revealed widespread misconduct in the finance industry. While Bullock said that evidence pointed to reduced demand for credit as a bigger factor in the housing slump than tighter lending conditions, the RBA is still worried about banks shying away from some loans.